That's right, init is deprecated since Mutan 0.2. I get stuck at the next point in the tutorial however; retrieving the storage values from the contract with eth.getStorageAt() returns an empty string. Any suggestions welcome. Just found a - presumably correct - version of the currency contract on the Mutan 0.4 examples page. The only difference there is return compile instead of exit compile. Not sure yet if that's the culprit. Testing with it now. I have added the exit codes so I can do some additional testing, not really required. Trying to run that same tutorial. It seems I can send the contract (at least it returns an address for it: "aeefdefa73ae6a207ca1ae52840ddf168b9b438d"). Now when trying to query the amount initially stored (i.e. at contract.storage[tx.origin()]), it does not seem to work. The returned value from the callback to eth.getStorageAt seems to be empty. Yet, based on the following console output, I believe the call to getStorageAt went through, no? Any idea what did I miss? Actually is there some tool with a friendly GUI to query the blockchain? Thanks @mids106‌, using that contract now. However got stuck further on the way, see post below. @rapidos‌ we seem to have run into the same error. In addition to that, the Go-Ethereum / Ethereal client currently fails to update the testnet blockchain. Thanks Aron for these pointers. I am indeed still stuck on the same problem (where the callback from getStorageAt returns an empty string). which does return indeed the right amount. 1. Make a build from the git/develop branch (as opposed to the master branch). 2. To avoid the '25531 block error' on testnet, I did run my own blockchain from scratch, using also a connection to the seedless node on 107.178.217.2:30303. Now I'm trying to gather more clues through AlethZero (I've simply downloaded the dmg build from git releases section). AlethZero does pick my Ethereal blockchain (the blockchain panel does list the correct blocks: same hashes). But I do not know how to explore the blocks, states and contracts with AlethZero. Ok, will post my AlethZero related questions on the "Cpp Implementation" category of this forum. Thanks, a local setup with Ethereal/AlethZero interoperating is very useful! I'll be interested to hear about your progress. I'm stuck with the same issue, can't query the initial amount of storage. Anyone had any luck with the issue? 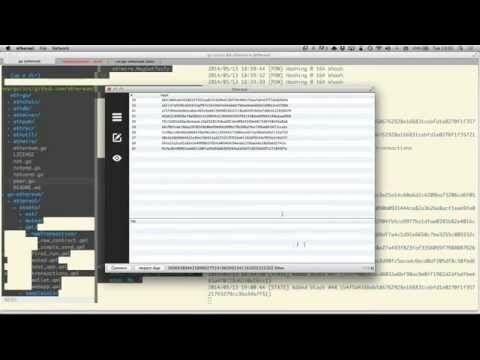 Should I just use Serpent & AlethZero and forget the go-ethereum client? @AronVanAmmers‌ @rapidos‌ did you have any luck with this issue? @heliumcraft‌ up to now, no. I'm in the process of building a version of Ethereal from the latest source code, but I don't have a usable version yet. I'll update when I have. From the current release versions, AlethZero the most usable / working in my experience. But things move fast. This will return a (long) JSON string with all properties and methods of eth in your current version of AlethZero (should work in Ethereal too), which you can turn into something readable by using for example JSBeautifier. @AronVanAmmers: thanks for the tip, quite useful! That tip works in Ethereal as well, although there it just list the function names and not the parameters. - sometimes the ethereal client seems to cache the js code and doesn't reflect the code changes, changing the js filename works. This , plus using my own Testnet, I can get the balance. Changing the part "123" after every change makes sure Ethereal picks up the new version.